Uinta Golden Ale Packaging Celebrates Our National Parks. Last year, the National Park Service celebrated 100 years of service, and to commemorate the anniversary Uinta Brewing is ready to release Golden Ale Park Series Beer. The rotating park series was brewed in celebration of the diverse landscapes across the United States and the over 84 million acres of natural beauty that our National Park system promotes and protects. The packaging is available with four different park-inspired packaging that reflects the style of travel posters designed during the height of the WPA era of the 1930’s. While the beer inside the can will remain the same, a refreshing golden ale with an ABV of 5.3% and notes of Wilamette hops and Crystal malts, the outer packaging will feature a rotating line-up of National Parks. right now there are just 4 parks represented, but hopefully they will release more over the next year. I love the design and illustration featured here. It’s a refreshing approach to a product area that can at times be predictable, even in the craft brewing segment. Posted in Design and Art, Packaging and tagged Beer, Design, Graphic Design, Illustration, National Parks, Package design, Packaging, PArks Service, Unita Brewing, WPA on February 23, 2017 by Author. The liquor packaging business is tough. You need to design something that stands out form the crowd, is memorable, reflective of the core brand, and fits well within the shelving of stores. 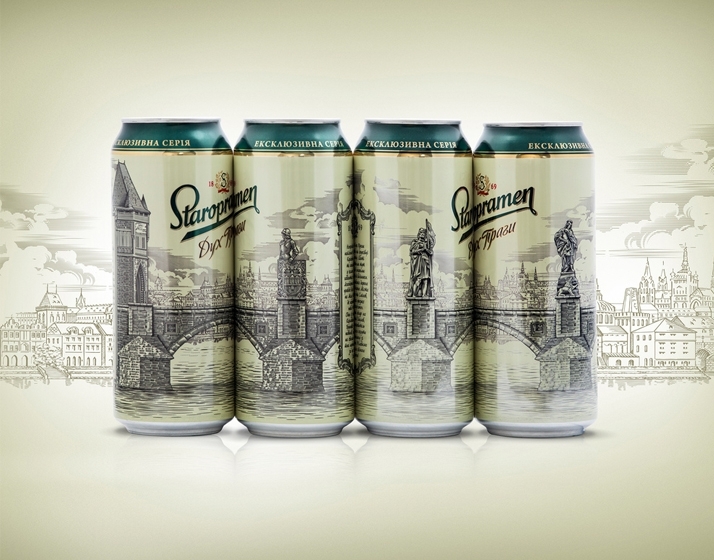 BBDO was charged with designing limited edition packaging for Czech Republic Staropramen Lager. 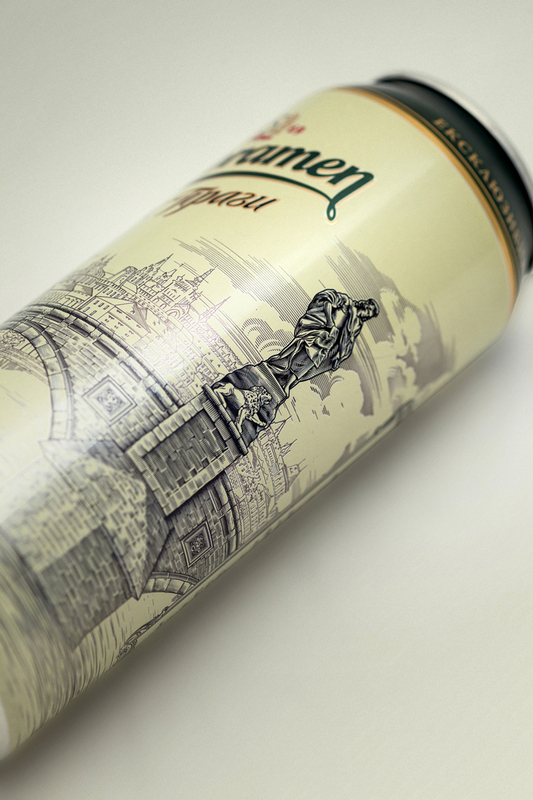 (my beer of choice when I was in Prague) SunInBev asked BBDO to create a design that kept Prague at the heart of the overall packaging. 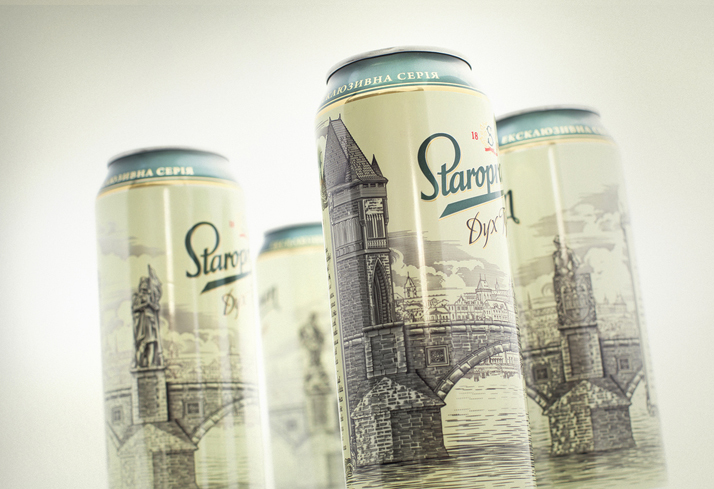 The result is a series of cans that when stacked side by side build Prague’s famous Carls bridge that spans the Danube river. The limited edition Staropramen cans were introduced to Ukraine & Russia in the spring of 2014 with another limited edition launch for the UK and 4 other European countries coming later this year. I love the look of the overall design. The green and cream color reflecting the Staropramen brand, combined with the black line art with the tight engraved look gives this a feeling of fun and sophistication. Getting All Squirrely on My Beer. The Mill for Smithwick’s. Being an animal wrangler for film and video has to be a tough job. Training and getting a squirrel to behave like a human would be a completely impossible task for any animal wrangler. This is probably why The Mill went all CGI on the creation of the squirrel brew master for Smithwick’s a 300 year old brewery. Director Simon McQuoid Worked with adam&eveDDB, and Gorgeous to create this very photorealistic squirrel for the 300-year old beer brand. It took this team five months to complete the spot, and two of those were dedicated to perfecting the look of the squirrel’s eye alone. Once again, it’s all about the details, and the craft. The song featured in the spot is the Kaiser Chiefs – Learnt My Lesson Well. I think that is fairly appropriate. Posted in Advertising, Animation, Video and Motion Graphics and tagged adam&eveDDB, Beer, CGI, Gorgeous, Simon McQuoid, Smithwick's, Squirrels, The Mill on July 16, 2013 by Author. 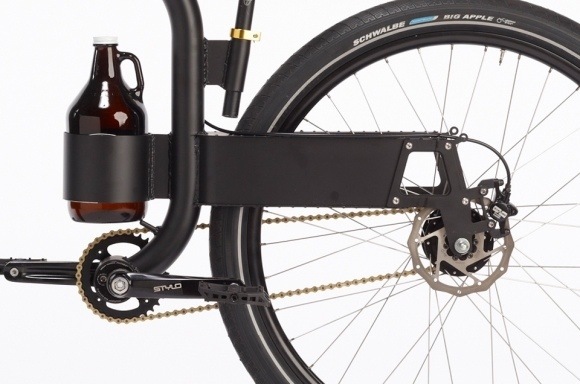 Growler, A City Bike With a Purpose… Beer. 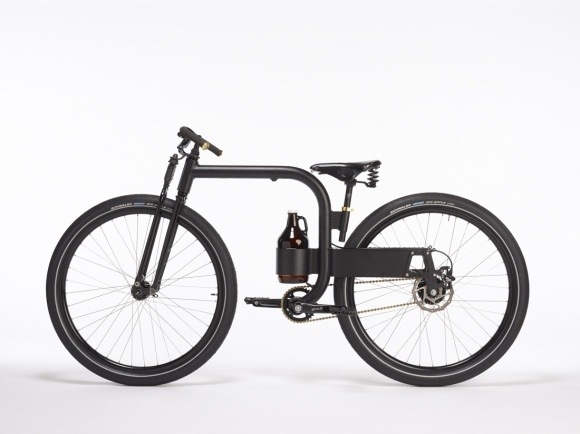 Would you look at that, a city bike designed with a dual purpose. Transportation, and transporting beer. 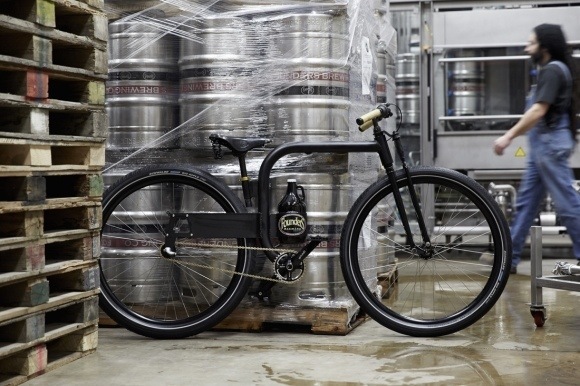 Designed by Joey Ruiter, the bike makes a statement with it’s rugged inverted J frame, monarch spring loaded front fork, oversized beer holder (hence the name Growler), matte black finish and two speed internal kick back hub. The bike concept is a working sketch prototype according to the designer, but I personally hope they make this into a production bike soon. The bike has such a unique profile that separates it from all other city and commuter bikes. The frame is heavy duty, but the shape lends an air of lightness to the profile. Placement of the seat low, and inline with the top cross bar add a feeling of toughness and an old school bike aesthetic. The oversized 29 inch wheels can take on what ever city streets have to offer. 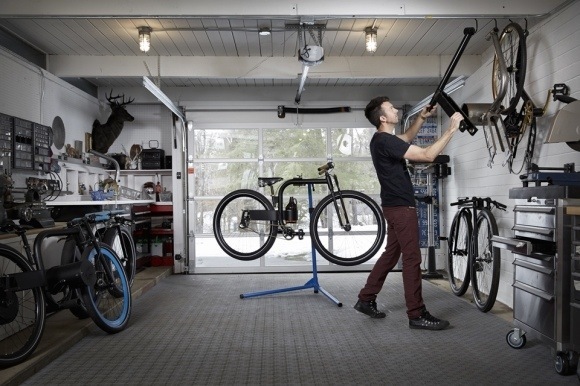 The disc brakes and other features let you know that this is a modern bike. Then there is the holder for the “Growler” a one gallon bottle of cold hoppy goodness. Not a required feature for a city or commuter bike, but definitely a feature that puts a smile on my face. Posted in Bicycling, Cocktails and Mixology, Design and Art and tagged Beer, Bicycles, Bike, Bike Concept, Bike Design, Growler, Joey Ruiter on June 19, 2013 by Author. Using 125 Year Old Tech in the 21st Century. This is one of those design/technology/promotional combinations that I love. As an extension to the Beck’s Record Label project, the brewer has created a beer bottle that is a record. Based on Thomas Edison’s cylinder recordings from the late 1800’s, Beck’s overcame technical and design challenges to bring this to life. The bottle was in scribed with a track from the Auckland New Zealand band Ghost Wave. The band’s new single was inscribed into the surface of a Beck’s beer bottle which could then be played on a specially built device based on Thomas Edison’s original cylindrical phonograph. The project was conceived and produced by Shine Limited. The video below shows how Shine overcame challenges to make this work, and the final result. Nice innovation drawn from 125 year old technology. Posted in Design and Art, Music and such and tagged Audio Recording, Beck's, Beck’s Record Label project, Beer, Design, Edison, Edison Recording, Ghost Wave, Music, New Zealand, Technology, Thomas Edison on June 17, 2013 by Author.